We had a little ‘mooncake festival party’ on Saturday to celebrate the Mid-Autumn Festival or Mooncake Festival, as how it’s called in Malaysia. This year the festival falls on September 22nd. It’s traditionally a harvest festival and celebrated when the moon is at its fullest and roundest. For us it was just another excuse to have our friends over for some food and fellowship. I also bought lanterns for the kids to play with. Playing with colorful candles and walking around with a bright and lighted lantern was what I did when I was a kid and I wanted my kids to have that tradition too. 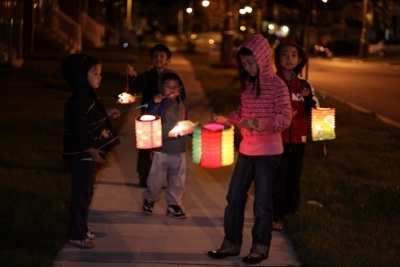 Unfortunately, I couldn’t find those colorful candles here but the kids did walk around the block with their lanterns.